The 80th anniversary (1939–2019) of the rescue of the Museo del Prado’s most important works and Spain’s artistic heritage, at what was certainly the darkest hour in its history, is the perfect occasion for an international gathering to promote research, debate and ideas on the topic of the museum and heritage in times of war. In early February 1939—from the 3rd to the 9th, with a two-day halt on the 6th and 7th when the area was bombed by Franco’s forces—the most important part of Spain's artistic heritage was evacuated from northern Catalonia to France in seventy-one lorries. These thousands of works included around of 600 pieces from the Museo del Prado—masterpieces by Velázquez, Goya, Ribera, Murillo, Dürer, Titian, Rubens, etc.—and assets from other museums, churches, institutions and private collections. Three years previously, when the Spanish Civil War broke out in 1936, the Republican Artistic Heritage Council began evacuating works from Madrid to Valencia. From there they travelled to Barcelona and Figueres and finally made their way to Geneva in 1939. 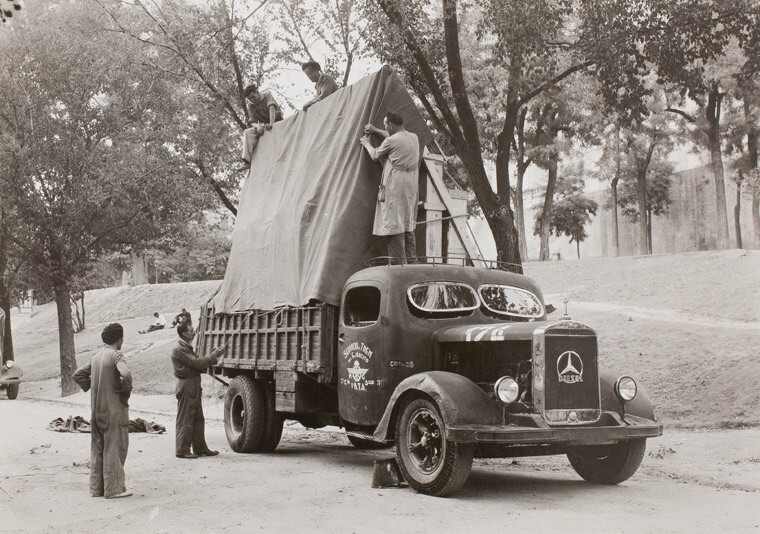 The seventy-one lorries were driven and loaded by Republican forces, and the evacuation was directed by Timoteo Pérez Rubio and the members of the Central Artistic Heritage Council with the assistance of members of the International Committee for the Safeguarding of Spanish Art Treasures, an initiative proposed by painter José María Sert that brought together the leading museums of the democratic world (the Louvre, the National Gallery and Tate Gallery in London, the Rijksmuseum in Amsterdam, the Musées Royaux des Beaux-Arts in Belgium, and the Metropolitan Museum of Art in New York). It was a remarkable show of international solidarity, in which various museums joined forces to save Spain’s artistic heritage from grave danger. After being inventoried by the International Committee, the bulk of evacuated Spanish works returned to Madrid in May and June 1939. However, Francoists selected 174 works from the Prado and 21 tapestries owned by the Spanish heritage agency Patrimonio Nacional to organise an exhibition at the Musée d’Art et d’Histoire in Geneva. Between June and September, the show enjoyed an unusual success in those dark days when the terrifying prospect of war loomed on the horizon. A few hours after it closed, World War II broke out. The train that transported the artworks back to Spain sped along French railway tracks in total darkness for fear of a possible German attack, arriving in Madrid on 9 September 1939. Submission of paper proposals: until 25 June 2019. Send the title, name of the author/s (max. 3), institution and a 40-line abstract to area.educacion@museodelprado.es specifying the subject: Submission of paper proposals Museum, war and post-war protecting heritage in armed conflicts. Notification of acceptance: 15 July 2019. Complete text, minimum of 4,500 words and maximum of 7,500, including references.